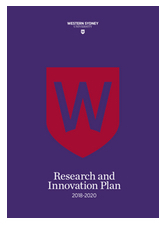 The Research Theme Champions initiative was established in 2016 by appointing Western Sydney University academics tasked with creating flexible team structures for collaborative research; developing an overarching vision for their research theme connected to society’s grand challenges; increasing research output and impact in complex and interdisciplinary research areas; mapping of research focus in the University; servicing those areas of research strengths; and, increasing awareness of, capacity within, and alignment with the designated University research themes. Eight Theme Champions have been appointed across the four Research Themes. Monitor and implement the University’s Research and Development Plan, with attention to the research themes. Produce traditional and non-traditional research outputs. Develop clear guidelines and processes in keeping with the theme vision to enable staff to contribute research to the University’s research themes. Contribute to organisational units’ development of strategic and operational plans related to the theme. Theme Storms bring together key academics working within a theme area to discuss collaborative research programs and funding opportunities. They also serve as a discovery session for Western’s academics to map out research areas of mutual interest. Theme Champions have access to a pool of funding to accelerate existing and seed new collaborative research projects.